Just a few days before NAB 2018, Apple has announced a long awaited update to FCPX, Motion and Compressor. The headlining features in the new 10.4.1 version update of the software include the ProRes RAW codecs and robust Closed Caption support built right in to the FCPX interface. Closed captioning in Final Cut Pro now includes tools to add captions to projects without the need for third-party software or services. You can now import closed caption files directly into your project, or create them from scratch as you edit. They will appear in the viewer during playback and can be attached to video OR audio clips in the timeline, so they automatically move with the clips to which they’re connected. The fact that they can be attached directly to audio clips in the timeline is a new and welcome change to the way FCPX works, as it makes much more sense if there is voice over or some other similar situation where the audio wouldn't necessary be attached to a video clip. You can edit all captions from the inspector as well, including the location and look of the text. The addition of captions is also greatly enhanced by FCPX's unique Roles features, as you can create multiple version for different languages and turn them on and off with a tick of a box. The new ProRes RAW and ProRes RAW HQ formats allow you to import and edit from the camera/recorders just like regular ProRes, while also still providing flexibility when adjusting highlights and shadows like RAW. 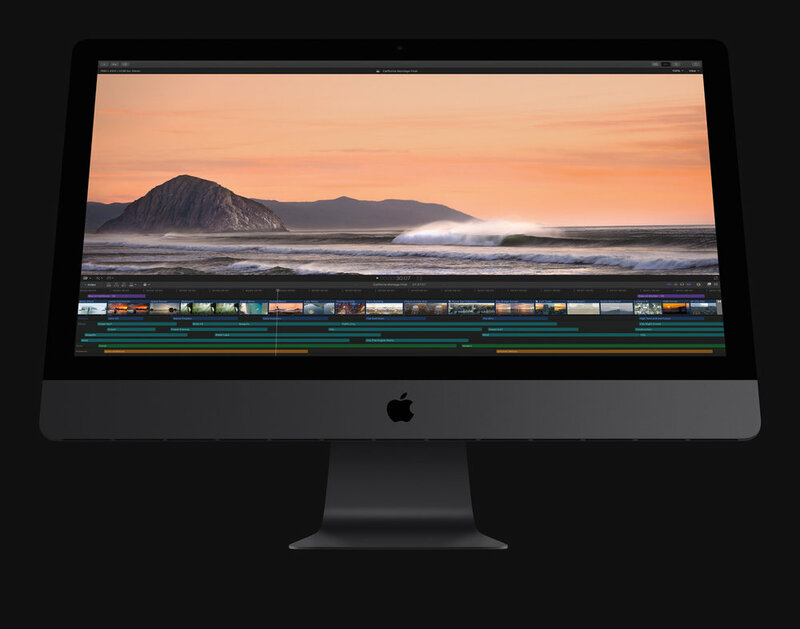 According to the release, the ProRes RAW performance optimization for macOS will allow editors to play full-quality 4K ProRes RAW files on even the MacBook Pro and iMac systems in real time without rendering, not just the iMac Pro. Another amazing aspect of this new codec is the fact that ProRes RAW files are even smaller than ProRes 4444 files, which helps to save a ton of hard drive space! You can work natively with ProRes RAW and ProRes RAW HQ files created by Atomos recorders, who Apple has partnered with. I don't generally like external recorders, for their added bulk and messy additional wires, but this is definitely something to consider now. The update is due to be released in the Mac App Store on Monday, but as per usual with FCPX updates, there are at least a few nice "easter egg" features hidden in the update, released without any fanfare. I think my personal favorite I've seen so far is that the app will respect each Roles on/off check box in the timeline index upon exporting your project. Basically, whatever Roles you have enabled in the timeline, is what you get on the export. Previously, if you had certain Roles turned on or off in the timeline, and went to export the project, they would all export as "on" unless you manually went in to the Share settings and disabled them for that particular export. This was simply a waste of time and a very unintuitive, backwards way of doing it. Now its a WYSIWYG or "What you see is what your get", which is great and how it always should have been. Here's to hoping there is more where that came from! I'm often asked to send clips with handles to other editors that I'm working with. Final Cut Pro X somehow still doesn't support exporting a clip with handles directly from the timeline, which hopefully will be fixed soon. Until then, I've been using a method that can "Resolve" this problem! Complete your edit as you would normally, export the project FCPXML from Final Cut Pro X. Fire up DaVinci Resolve and import that FCPXML by going to FILE>IMPORT AAF/EDL/XML from the top menu bar. This will prompt you with some settings windows, just click OK.
Now your timeline should be open in Resolve. In the edit page you can select the clips you'd like to export with handles most easily by using markers. Once you've marked your clips you want to export with handles, you can go to the Export page and select the "Clips" drop down menu to filter for the clips with markers. Make sure to set your Export Destination and choose "Individual Clips". Choose the codec, resolution, etc that you want to export the clip(s) as, and at the very bottom of the "Advanced" drop down tab you can choose to add your desired length of handles. Once you do this, add the job to the render queue and export as normal. Your selected clips will be exported with handles, easy as that. One could argue that this has been a long time coming, especially with many software creators (e.g. Adobe) turning to subscription based models to keep their cash flows steady. The more interesting (worrisome?) question is what will happen with Apple's own Pro Apps like Final Cut Pro X, Compressor, Motion 5, Logic Pro X? On one hand, its kind of mind blowing that with all the updates and improvements to Final Cut Pro X since it's 2011 debut, that Apple hasn't charged for a single update. Could this change bring a new monthly charge to get the next version of Final Cut Pro X? Or perhaps not a full blown subscription, but will this simply put in place a method for Apple to charge an upgrade fee when there is a significant update to FCPX? Both are somewhat plausible, although the latter seems to be more so, in my opinion. With a new update of Final Cut Pro X rumored to be coming some time next week during WWDC 2016, it would stand to reason that any changes to the way it's being priced and sold will be revealed at that point as well. I personally doubt that Apple will start charging a subscription price for any of the Pro App's, simply because they have no track record of doing that in the past, and its relatively "small potatoes" in the grand scheme of their vast business. I've always thought of Apple's hardware as being "the cars" that they sell and their software as being "the road" on which you can "drive" the car on. Basically, they stand to make more money, more often if they have a good ecosystem (highway system?) of software on which to run their very profitable hardware on. Also, while the Final Cut Pro X user base continues to grow as more people come to understand its power, it's still hasn't completely shaken the stigma it unfairly earned when it debuted back in 2011. It seems that it would be in the best interest of Apple to continue to make it readily accessible to the masses at its incredible one time price, and it will continue to permeate slowly outwards to the Youtubers, students, bitter FCP7 die hards, old-timer AVID fogey's, anti-subscription Premiere users, and to the masses of other post production professionals who may now be willing to give it another chance.